Since the concept of using electricity for practical purposes began in the mid-1800s, science and industry began looking for a machine that could pinpoint metal hidden beneath the earth's surface. This machine would have many uses throughout its lifetime but its design was originally sought out for the purpose of generating wealth. This quest for such a device came during the period after the Gold Rush when deposits where running out and prospectors needed all the help they can to find them. Although the metal detector had been conceived for finding riches, the first metal detector in recorded history was not used for finding gold. In fact, its purpose was for saving the life of a President. On July 2nd, 1881 in Washington D.C. at the Baltimore and Potomac Railroad Station, Charles J. Guiteau shot President James Garfield in the back as the he was leaving on holiday. The bullet did not kill Garfield but doctors were unable to find where it had lodged in his system which was causing Garfield undue suffering. During his convalescence, Garfield was visited by Alexander Graham Bell who invented the metal detector specifically to help locate the bullet. Unfortunately for President Garfield, the metal detector was unable to locate the metal bullet because the springs on the bed made it impossible for the device to give a good reading. Even though Alexander Graham Bell's metal detector did not end up saving a life of a President, he did end up creating a working metal detector. This prototype used on a President Garfield was the forbearer of every metal detector to come. Although running on large and problematic vacuum tubes, these earlier models did save lives by clearing dangerous explosives that littered the battlefields of Europe after World War I and II. It was around this period that the modern metal detector took shape and people began tinkering heavily with the technology. Gerhard Fisher, the future founder of Fisher Metal Detectors, was working on navigational systems right after World War I. He discovered that radio beams emitting from these systems became distorted whenever there was ore in the area. Fisher discovered that this kink in the system had a practical effect and that it could be used on a smaller scale as metal detector. Fisher was granted a patent for his portable metal detector in 1925 and then made his first metal detector available for purchase in 1931. 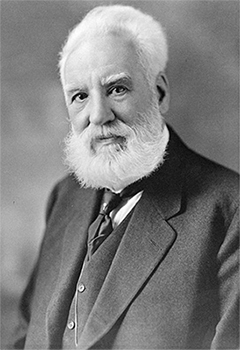 Although Alexander Graham Bell first created the metal detector and Fisher was issued the original patent on one, many more were responsible for the further development of this device. Unable to find a metal detector that did everything that he wanted to Charles Garrett began work on his own device in the mid sixties. His persistence in crafting the perfect metal detector led to the elimination of the oscillator drift and the creation of revolutionary search coils that are still used today. Garrett wasn't the only one who helped to improve the metal detector. The invention of the transistor 1947 by John Bardeen, Walter Brattain and William Shockley along with wireless technology, discriminators and new search coils by others continued to mold the modern metal detector. These technologies allowed the metal detector of today to become simpler and more adept for longer treasure hunts. As time goes by, more and more hobbyists and professionals will continue to see new and exciting changes come to the metal detector. What the future holds for every treasure hunter's favorite device is anyone's guess! Always been pleased with choice of products and ease of ordering. Steve was very helpful. Thank God he sold me the Vulcan 360 pointer with my Fisher detector. A beginner must have a pointer.